Thirty-something Malky works as a labourer demolishing the church where he was abused as a twelve-year-old, engaging in an emotionally distant sexual relationship with Emma and indulging in bouts of casual violence. The effects of his childhood abuse remain deeply embedded, and when the priest responsible returns to town Malky is forced to confront his past head-on. After their first film THE PYRAMID TEXTS (now available on iTunes), the brothers Paul and Ludwig Shammasian return to the Edinburgh International Film Festival to present an impressive new film: ROMANS, which has a tragic background and resonates with the audience for a very long time. The basic storyarc of the film is autobiographical and tells the story of screenwriter Geoff Thompson, as he told me in an interview. Thompson himself was abused by a priest as a 12-year-old, causing him to become extremely violent, doing martial arts and working as a doorman for years. It was only through the creative process of writing, that he did find a way to deal with his anger. Until now he has written more than 40 books, which have been translated into more than 20 languages, as well as five films and three stage plays. At some point, Thompson stumbled upon his abuser in a café and was confronted with his own past. Although he could have easily killed him without any problems, just because of his physical stature, he realized at that moment, that this would not solve the problem. So he forgave him, which was much more powerful and indeed the beginning of the healing process. For many years, Thompson did not want to talk about the subject, until the brothers Paul and Ludwig Shammasian convinced him. He confided in them, because they had already worked together on THE PYRAMID TEXTS. The result is a film that could hardly be more impressive. Orlando Bloom – believe it or not – delivers the performance of a lifetime here – Usually I really hate this speech, but here it’s just the simple truth. Forget the big blockbusters like PIRATES OF THE CARIBBEAN or shallow comedies like ELIZABETHTOWN – In ROMANS, Bloom can finally show, how much more he is capable of. Through his facial expressions and gestures, he manages to let the viewer feel every single pain that’s within him. It’s no wonder that Bloom wanted to shoot this film so badly, and surprised the two directors with his impressive preparation for the role. 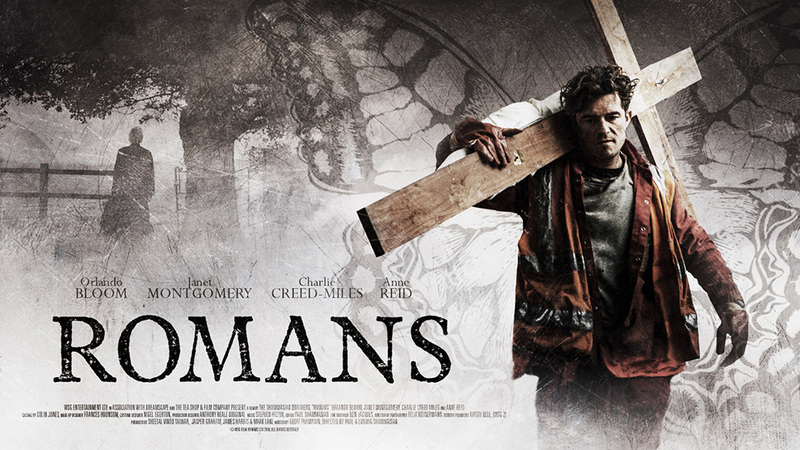 Rarely a film has touched me so deeply like ROMANS. Although I had high expectations – as THE PYRAMID TEXTS 2015 was one of my favorite films in Edinburgh 2015 – they were exceeded by far. A film that’s showing what terrible effects an abuse could have on someone and what indescribable power lies in the act of forgiveness. At the Edinburgh International Film Festival I had the opportunity to talk with the directors Paul and Ludwig Shammasian, as well as the writer Geoff Thompson about the film. The interview will be published shortly right here.